“Palestine.” Map. Google Maps. Google, 31 Oct. 2018. Web. 31 Oct. 2018. 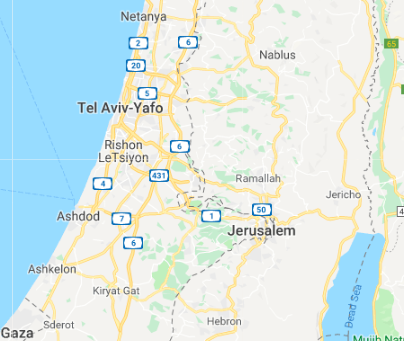 Palestine is pronounced “FilasTeen” in Arabic and is strategically located on the eastern shore of the Mediterranean Sea. For centuries it has been the place of territorial disputes and has survived battles, conquests, crusades, mandates, partitions, and world wars. A historical land of heritage and culture, Palestine has always been at the forefront of fashion and design. Palestinian attire for women differs depending on the occasion. For instance, velvet is the cloth of choice at weddings especially if one is related to the groom or groom’s family. Metallic thread known as “qasab” is then stitched onto the fabric by using a sewing machine . The seamstress can be well known for the exemplary patterns and color palettes she chooses to demonstrate. This is especially true in the Ramallah area. Cross stitching is also a fundamental stitch in Palestinian culture and attire. For ages, cross stitching has been a vital component in Palestinian attire. One amazing aspect of Palestinian dress is that each town or village embraces a certain style that distinguishes one village from a neighboring village. Certain colors and /or cross stitch designs can be significant to one village and not the next. So much so that a woman may be recognized for the village she is from simply by the dress she wears. “Annole” is another method of sewing where thread is looped and stiched into specific shapes and patterns.This type is also prominent in the Ramallah area. One immigrant shares her personal experience with us as she narrates her story of growing up in Palestine and then marrying and immigrating to the US. She shares with us her hopes and dreams for her family and for herself as she evolves into a wife and mother and eventually returns to visit Palestine. Another immigrant, Ibtisam A. shares with us her personal narrative and pictures of this garment that was made by her grandmother as a gift. We can see that this white and blue needle point creation is cross stitched with blue thread in a traditional checker box pattern onto white, cotton-based material. The pattern was then filled with silk thread according to natural floral envisages which have been handed down from one generation to another. Creating such cultural gowns proved to be a laborious task, therefore many members of a family shared in its construction. This particular gown was produced as a wedding gift from a grandmother to a granddaughter, welcoming her into womanhood. The rich floral pattern exemplifies the religious, Islamic standards to which such attires are bound. 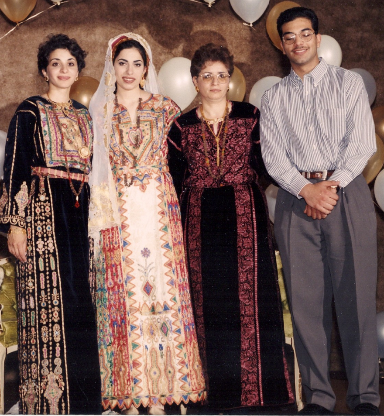 The pattern and style of the gown displays that which can be identified with the outlying farming areas of Ramallah, from what is known as Silwad. Aminah is a second generation Palestinian American born and raised in Milwaukee. As a second generation Arab she likes to wear traditional clothing to show her Arab culture because it represents who she is and where she comes from. Aminah mostly wears a’bayas and thobes on religious holidays. She also dresses up in them when attending wedding celebrations Her mother influenced her decision to wear cultural clothing. She states that as she was growing up she saw her mom wearing them to parties and celebrations, this sparked and interest in wearing them herself. 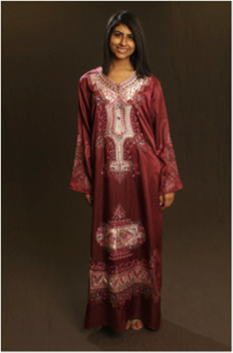 Aminah purchases her own dresses from either Jordan or the United Arab Emirates. When her mother travels to Palestine and back , she will bring thobes , abayas and dashadish with her for Aminah and her sisters. Aminah is a mother too and she would like to pass down this tradition of wearing cultural clothing to her daughter. 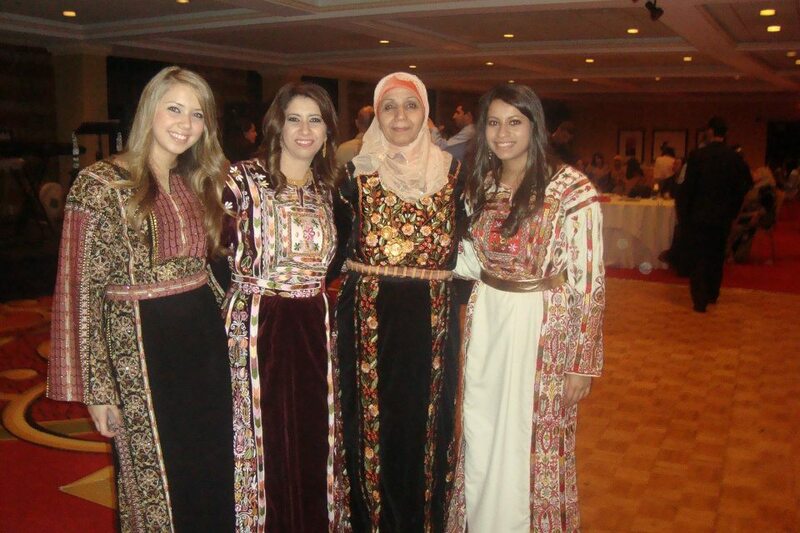 Afaf thinks it is important to pass on her cultural clothing to her daughter and daughter-in-laws because she believes this will carry on the Palestinian culture and allow them to pass it on to her grandchildren. Riham is a second generation Palestinian American who grew up in the Milwaukee area and is currently raising her three children in Milwaukee, too. Riham has a collection of dashadish and thobes that she enjoys wearing to hennas, weddings and special days such as Eid. These traditional dresses provide her with a strong link to her Palestinian culture and remind her of her grandmother who would sew every stitch by hand. Riham recognizes that the dresses continue to change over time and that “they are more modernized, the beads on them,” while Riham’s mother’s dresses are “more plain.” Riham gets her traditional dresses from her mother who buys them from Amman and Kuwait. 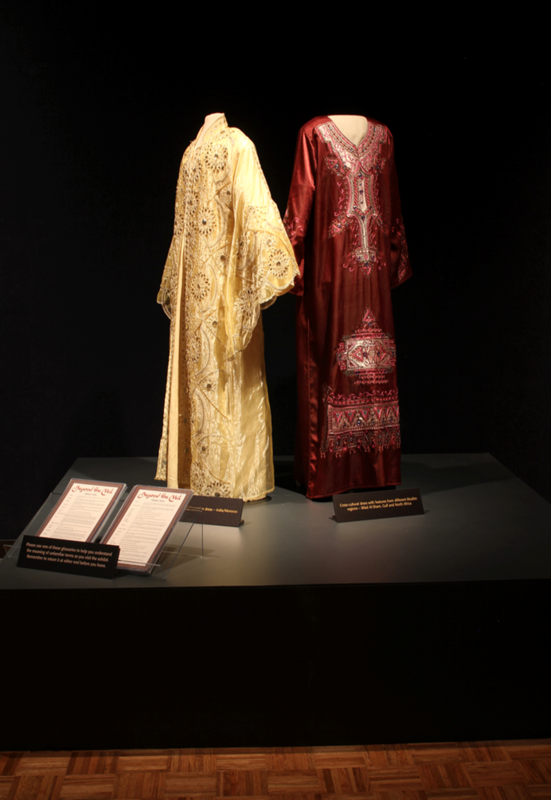 Riham hopes to pass down these traditional dresses to her own daughter, Nora. They are important to her not only because of their cultural value but also because she feels comfortable and content when she dresses modestly. 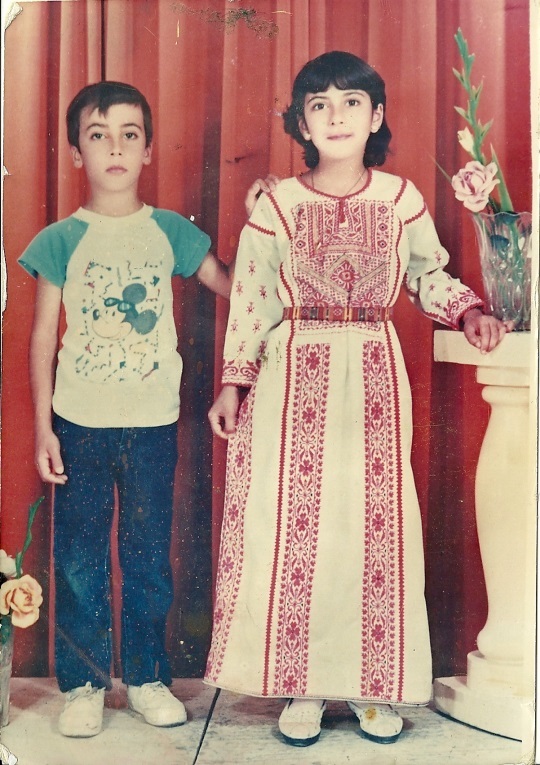 Salam remembers her mother wearing traditional dresses when she was a child, and although she did not receive any from her mother, Salam purchases dresses for her children and grandchildren during her occasional trips to Palestine. She purchases them not only to show her family how to dress but also to teach them about their history and their culture. Randa is a forty-five year old female from Jerusalem, Palestine. She is Muslim and considers religion to be a very important factor in her life, so much so that she encourages her children to participate regularly at the local mosque and attend community events that are held there. Randa loves living in the United States, but she often feels nostalgic towards Palestine. Randa states that when she goes back to visit her family and friends, she is more comfortable in terms of dress while she is there because everyone around her wears a similar type of clothing and dresses modestly, where as in the United States there would be times where she feels that she does not fit in because of the clothing she wears. “The most important thing is to cover my hair,” she says, directing attention to her hijab. 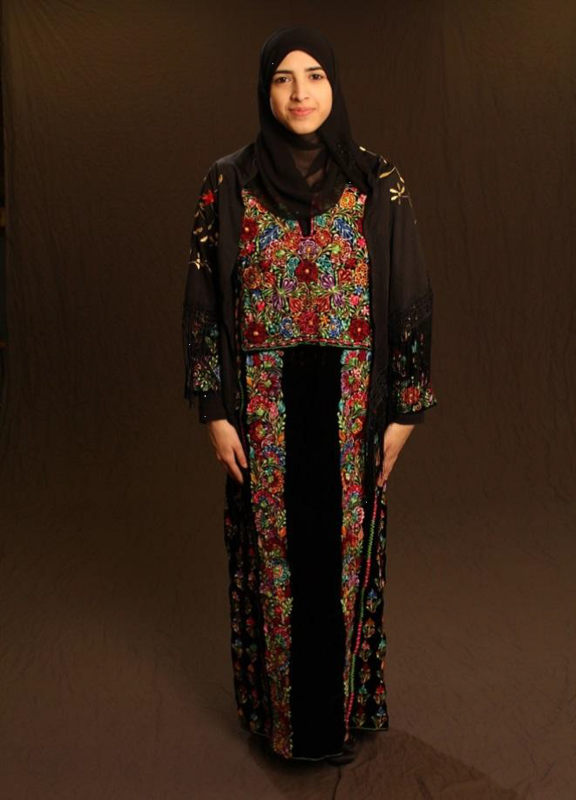 Cultural clothing is of great importance to Randa and she expresses that her mother and grandmother wear traditional Palestinian clothing on a daily basis. Randa states, “it’s a long dress with too much work on it, it’s very nice!” The cultural clothing is usually handmade using various cross stitch patterns and can be any color. Randa owns many pieces of traditional clothing because she believes it is important.She purchases them from overseas or from a shop in Chicago and she wears these timeless pieces to weddings and special occasions. Randa tells us that she owns a few traditional dresses that were passed down to her from her mother, and she lovingly proclaims that she will pass them on to her daughters at some point to keep the culture alive. immigrated to the United States in 1972 and continued to possess great pride for her Palestinian heritage. 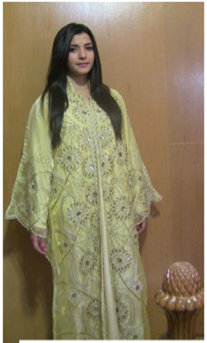 Rabeeha believes that traditional clothing is a tool to portray one’s culture. The cultural clothing pieces she owns consists of cross-stitching, which is handmade in Palestine, and others which are made by machines. Rabeeha expresses that the traditional piece of clothing is called, “thob-al-philistini.” She also says that the thob is worn in special occasions such as weddings or for organizations. Rabeeha expresses that she feels proud and happy when she wears her cultural clothing, she says, “it’s the past-if you don’t have past you’ll never have future…that’s our roots, that’s our things, and we have to keep it alive.” Her past is crucial to her future and her cultural clothing allows her to keep her past alive. Rabeeha believes that the cultural clothing was influenced by religion in the past, but not as much nowadays. Her reasoning for that is the way the dresses are designed, they have long sleeves and cover the entire length of the body. Rabeeha’s mother always wore the thob back home and Rabeeha plans to pass it on to her children just as her mother passed the clothing on to her. Cultural clothing is extremely special and meaningful to Rabeeha. believes her father left Palestine because there were less job opportunities in a war zone and it was not a safe environment for his family to live. Naziha defines herself as an Arab- American. She recently began to wear the headscarf on a daily basis in the United States. Her reasoning for putting on the headscarf was the amount of shame she felt when strolling through the streets of Palestine without it on during a visit. 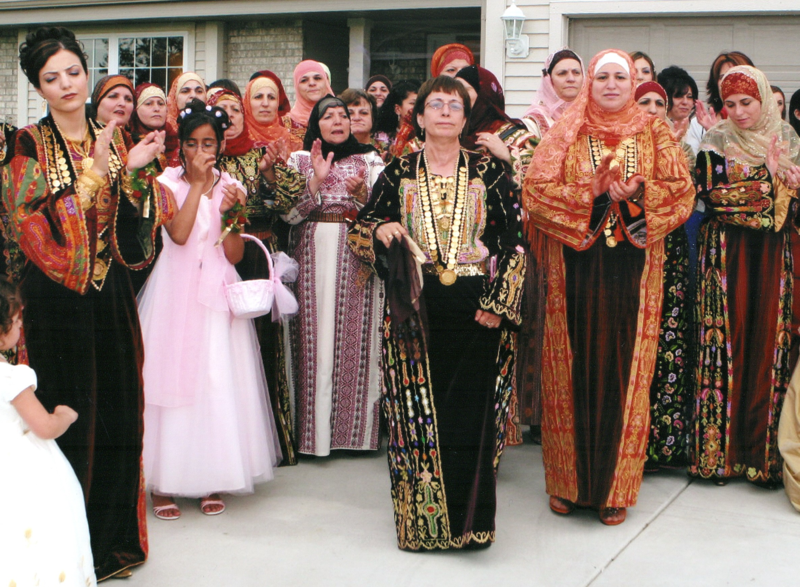 Culture is of great importance to Naziha and she attempts to bring back her culture to the United States from her visits in Palestine through clothing. Although her mother wears the cultural clothing on a daily basis, Naziha only wears traditional clothing to weddings or other special occasions. She expresses that many women wear gold jewelry with their thob, especially when they are relatives of the bride or groom. The cultural clothing she wears is called a “thob.” Naziha expresses, “you feel on top of the mountain” when she wears her thob. She describes that it is a beautiful feeling and look when she puts on her traditional clothing. Naziha states, “I feel very great and elegant with it.” Naziha loves her cultural clothing and believes it is important to pass it on to her daughters. She expresses, “It’s very important, because if I don’t wear it and then my daughters don’t wear it, then that cultural stuff is gonna die. So we try to keep it at least going for uhm weddings, and like on holidays.” Naziha wears the thob to preserve the traditions, which she does not want to die out. Ruba is a 23 year-old second-generation immigrant female who was born in the United States. She identifies herself as American Palestinian and spent a portion of her life living in Beitin, Palestine, where her parents are originally from. She greatly appreciates her parents’ style in raising her and her siblings. Ruba says that her parents’ open-mindedness and understanding gave her the freedom and support to choose her career independently. Ruba expresses what cultural clothing means to her. She states that she owns a few pieces that her mother has bought her and she only wears her cultural clothing on the day before the wedding, which is called a “henna.” She explains that on the “henna” she wears a clothing piece called a “thobe” which is very traditional and most women wear gold with it. Ruba is proud to wear her “thobe” because it symbolizes to others that she identifies as Palestinian. In addition, Ruba is sure that she will pass her cultural clothing pieces on to her children in the future. Soraya was born in the United States and after spending three years in the Milwaukee school system, her family decided it would be beneficial for her to continue her elementary, middle school, and high school studies in Palestine. As a result, she has learned to speak her Arabic language fluently and can identify with her culture. Her parent’s motivation to provide an education that promoted her heritage has transcended into Soraya’s family’s upbringing. As a mother of four, Soraya asserts that a mother is the fundamental building block to a child’s moral and religious beliefs. Soraya also emphasizes the importance of wearing a hijab, and she believes cultural clothing is influenced by religion at times. Soraya explains that there is a piece called a “thobe” which is cross stitched and usually worn by those who live in villages. Soraya states that women usually wear a belt with it and a veil that does not properly cover your whole head, but you could wrap it around your head and keep it in place with pins. The dresses are fairly expensive because they are custom made for your body and it takes a lot of time for the cross stitching to look presentable. Soraya feels proud when she wears her “thobe” to special occasions because it helps her identify with her culture and she plans on passing her traditional clothing on to her daughters someday. Maram is a first generation 45 year-old female who spent her childhood growing up in Jerusalem, Palestine, then immigrated to the United States along with her family in the year 1980 for financial reasons. Maram is a proud to be Muslim and describes that being Muslim was easy back home because the majority of people who lived around her shared the same religion.When asked about her family life Maram tells us that her marriage was not arranged, but rather done in a cultural way. She says, “he ( the suitable bachelor who later became her husband) saw me, who I am–like I said before–the village, you know, everyone know each other, everybody knows everybody and he asked for my hand.” Maram has been married happily for several years and has four children, two boys and two girls. Maram explained to us the typical Palestinian cultural clothing that her mother wears. She states, “it is a long dress with too much work on it, it’s very nice!” she went on to say that there aren’t any specific colors or patterns for the traditional Palestinian dress. Maram tells us that her grandmother and her mother both dress differently: her grandmother would not wear anything but traditional Palestinian clothing whereas her mother is slowly beginning to just wear a dress that covers her entire body rather than the traditional gown. Maram decides to wear jeans and long shirts on a daily basis and most importantly, a scarf that covers her hair.Maram owns three traditional Palestinian dresses and will wear them on special occasions. She is proud to wear the traditional Palestinian dress, which she calls a “thobe.” When Maram wears the “thobe” she says, “I feel very beautiful, I like them. 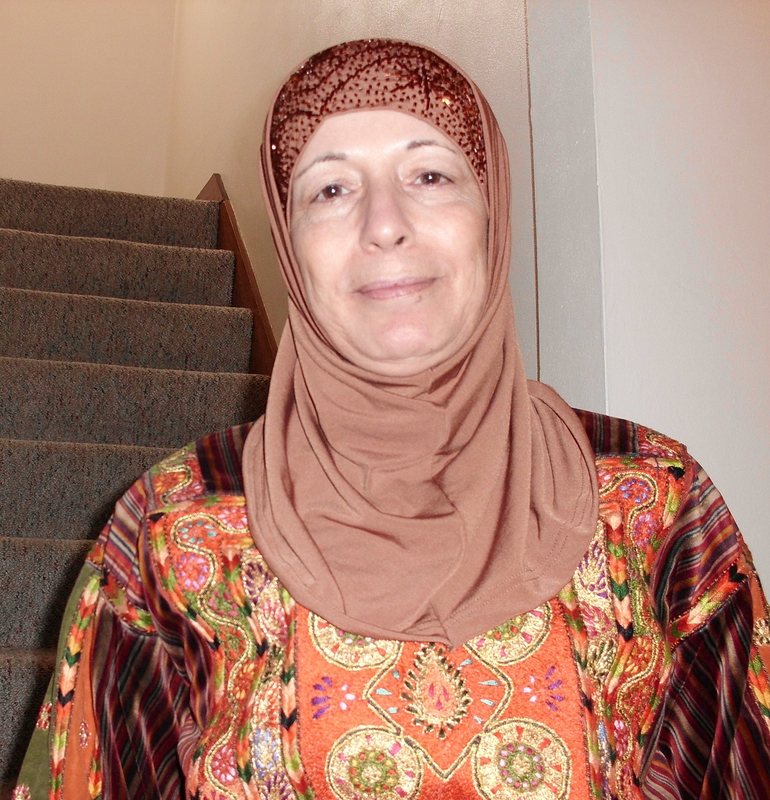 I feel relaxed.” When Maram wants to buy a “thobe,” she either goes to Chicago or back on a visit to Palestine where the dress can be hand-stitched or done by a machine. Maram states that gold is usually worn with the “thobe” and that religion plays a big role in the cultural clothing because it covers the body properly. Ibtisam immigrated to the United States in 1966 from Palestine. She shared with us how essential her cultural clothing is to her and the prominent role this attire plays in holding on to tradition. Ibtisam wears thobs and abayas when she goes to the mosque to pray, when she has company and when she attends weddings, parties, and conventions. In fact, cultural clothing serves as more than tradition to Ibtisam, it also gives her feelings of pride. When asked how she felt wearing the clothing, she replied “proud, [and] honored.” Ibtisam explained how each dress can illustrate what part of Palestine a woman is from through the patterns of stitching and the assorted colors used in the dress. Ibtisam says that she feels more attached to cultural clothing now compared to when she was a young girl because the clothing serves as a way to stay connected with her culture, it also serves as a reminder for her children to never lose their culture. 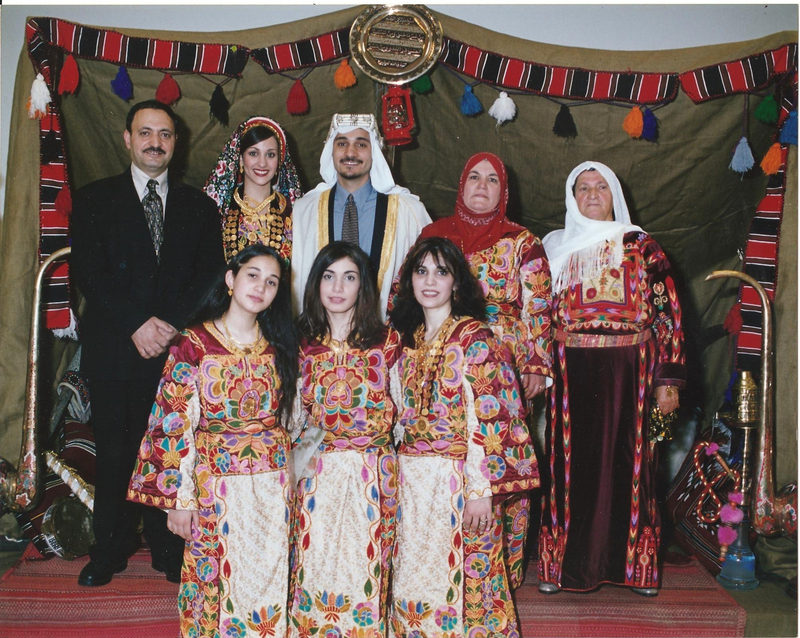 Ibtisam’s daughters wear the cultural dress to special occasion such as weddings, and social events, they appreciate the traditional style of dress more than the modernized dress. Ibtisam believes it is important to separate culture and religion, she recognizes the value of dressing modestly within both culture and religion. encouragement from the community, her family, and her children, Fatmeh continues to wear cultural clothing while feeling a great sense of pride with remaining connected to her homeland in Palestine. 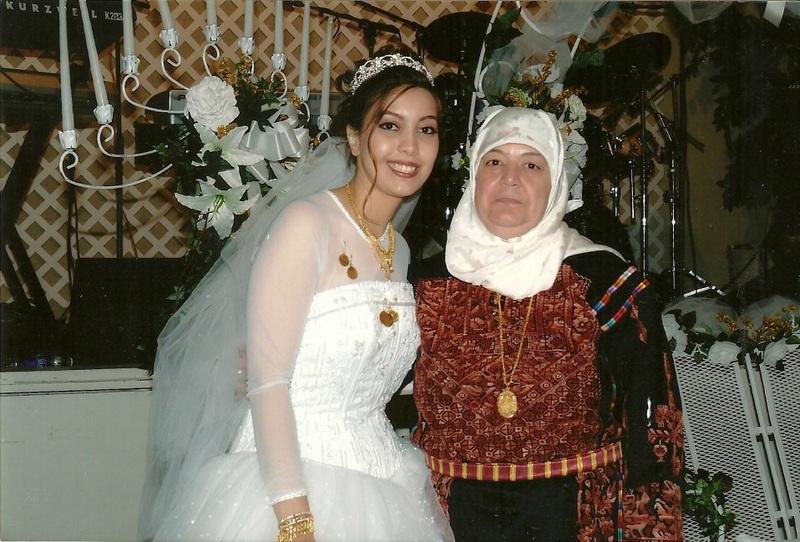 Najah, a first generation Palestinian woman, communicated what cultural clothing meant to her. She immigrated to the United States in 1992, from Amman, Jordan. wear her modern clothing on other days. 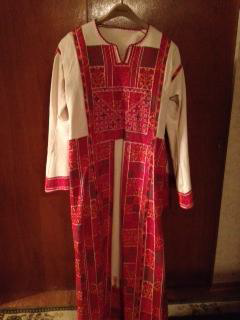 When she returns to Palestine or Jordan she continues to bring back these cultural clothing pieces with her. Her reasoning for that is to bring back a more modern style of the cultural clothing, but to also encourage her daughters to remember where they are from and be proud of their Palestinian background. Her daughters wear the cultural clothing to Henna’s and other functions and she hopes they continue this tradition when they have children of their own.